Another intense day, and the camino popped up in the most unexpected place today! Because we got back so late last night and we wanted to try to add Hammer to our list of sites today, we wanted to get off to an early start, but it was still 10:00 by the time we breakfasted, paid our bill and left our castle hotel to hit the road and start north. Wolfgang had found a much more direct way on smaller roads to get back to the Weiberverder/Hammer area; it was a pretty straight shot on small but good roads though tree lined roads. Again mostly low, gently rolling hills, fields, forests with a couple of resort areas thrown in around a cluster of lakes. Hammer is a small village with a church and a school, a former mill and not much else. This is where Ottillie and Adolf Hennig brought their two sons born in Weiberverder to be christened, and where one was buried. Unfortunately, the church was closed. As we saw along the road yesterday we passed several people in town returning from the forests with buckets full of mushrooms – chantrells. Our next stop was Arensdorf, where Adolf Hennig was born, and he worked as a “brenner”, distilling at the estate distillery at the time he married Ottillie. His father, August Hennig was described in Ottillie’s documents as a “Bauer” a farmer (who would have owned his own land) and a “gerichtsschulze” a person who was responsible for resolving small, local disputes and would have been next importance in a town under the mayor. The town was almost completely part of a huge estate. All the towns have been, but this is has been one of the most obvious. The estate house is still sitting, in a state of slow decay, but the large warehouses, barns and stable areas still exist and look to be in use. This is the first town where we have been where there have been signs of working farming people. Wolfgang spoke of how in addition to being in control of the surrounding farmlands, most estate lords had the right to distill alcohol and brew beer and pubs had to buy their supplies from the landlord. We were kind of in a hurry here as we had a one o’clock appointment, I was sorry because the architecture in the town was a little more interesting and it would have been nice to look around a little more. Wolfgang found the cemetery, where there were one or two remaining German graves, the rest having been destroyed. Then off to Sulecin formerly Zeilenzig. From this town we have the only existing photo of our family when in this area. The notation on the back says “Grandmother and Grandfather Menze” – in English. The photo is of a man and a woman, and as was the fashion the frame of the photo names the photographer and Zeilenzig, the town where the photographer worked. As I had asked for more history on the area to try to get a grip of the morass of shifting boundaries, Wolfgang had scheduled a talk with Mr. Cieluch, chef of Dom Joannitow, a Polish Organization that is working for better understanding, between peoples, especially, but not limited to the Poles and the Germans. It is very hard when learning about the history of middle Europe to really get a grasp on who exactly we are talking about. Wars, marriage alliances, religious orders, all have an effect on who is in control at one point in time, and with each shift in power place names and boundaries change, suddenly the teller of the story has a completely different point of view, so that trying to get a picture of one group of people, or even a particular place can be tricky as the sources will be completely different. The area we have been looking at can be Neumark, OstSternbeg, Brandenburg, Prussia, Lubuski, Weilpolski, Poland, and that is only since the 1850s. Our ancestors came from a place that was Prussia when they were born, Germany when they left and is Poland today. I don’t know if I’ve mentioned that in 1945 the Polish expelled the Germans from Poland. In the case of Wolfgang’s family they were given a couple of hours to pack up what they could carry and leave Grabow. Like the cemetery in Jarnatow/Arensdorf, almost all of the German sections of the cemeteries we have visited have aparrently been deliberately destroyed – the plaques with the names and dates of the deceased removed from their tree shaped pedestals and broken. It is still a highly emotional issue for both the Poles living there now, and the Germans who lived there in the past. Since the late 1990’s the Dom Joannitow group has organized a series of conferences to open a dialogue between these two peoples. I was impressed with Mr. Cieluch’s ability to attempt to chart a middle ground between them. I learned today of an added twist to the story, as Mr. Cieluch explained that after WWII the size of Poland was cut in half, the Eastern half becoming part of the USSR and the Poles were expelled from that area. The Polish government resettled many of them in the towns and villages in the Western part of Poland recently vacated by the expelled Germans. Mr. Cieluch is in fact a descendent from a Polish family so resettled. Mr. Cieluch (translated by Wolfgang with a little help from Maria, Mr. Cieluch’s assistant –herself a descendent of the Armenians, who suffered expulsion/genocide at the hands of the Turks in the early 20th century) gave a talk about the history of the Order of St. John and Dom Joannitow (Joannitow refers to the Order of St. John, and just as the Zamek Joannitow (the hotel in Lagow) was in one of the Order’s Castles – (Zamek = Castle in Polish), this organization is also housed in an historic Order building, thus it’s name). We toured the exhibits in the building, then had coffee and cake in the conference room where we had time to think and talk about the implications of quarrels between countries that reach far beyond the original quarrelers and the difficulty of reconciliation once hurt begins. Very small scale case in point, Wolfgang told us that we needed to give them some money for their time and the food they offered us. We were willing to do so, but couldn’t quite figure out how and where to do it. He covered for us but was still upset that we hadn’t done it ourselves which lead to a rather tense hour or so in the car, as we tried to figure out what to do to make it right. After the tour we spent a few minutes in the center of Sulecin. There is a tree planted in 1995 on the edge of the town square, the first step of reconciliation between the current and former residents of this area. This town is very close to Wolfgang’s heart as his mother came from Grabow to the hospital here to give birth to him. The hospital is one of the few buildings to survive the war more or less intact. We passed it, and we also passed the still existent house of some of his ancestors who ran a horse changing station. There is only one side of the old town square still standing, the rest was destroyed by a fire set by the Russians. Much of the town was left in ruins after the war. Mr. Cieluch remembers helping in grade school to restack the bricks from the ruined town hall to be sent to rebuild Warsaw. Like Jarnatow/Arensdorf, this town was more interesting to me, and I wished we would have had longer to stay. In addition in the center of town was a big map suggesting a 5k walk through town which looked intriguiging. Finally to Grabow. This is the town I have been most familiar with over the years as it is the town where Grandpa’s grandmother was born and where she and Adolf Hennig got married. 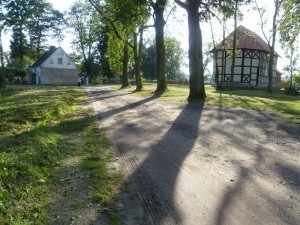 It is also where Wolfgang lived as a child, so he had supplied me in the past with photos and his family stories. Since Wolfgang knows this area, he was able to get the key to the church and we visited the inside . The half-timbered church that is there now replaced an earlier one in 1860, so Ottillie would have been Christened in the older church but she would have been married here. It is also probably where she stood God-mother to a number of the godchildren mentioned in the Bible. Just across the street from the church we again found our selves on the remenants of a large estate. Because of the configuration of the estates and the towns, I get a sense that this was a much more feudal society than the more middle class towns of western Germany. Wolfgang said the family that owned it had been the Von Bonin family. He said that the estate’s manner house was called a “Schloss” or castle. As he was growing up he heard all about this or that schloss in Neumark, and was surprised as an adult to see mostly smallish manor houses. Ottilie’s father, Johan Menze was described in Otillie’s documents as a “kossath” a small farmer who rented land from the estate owner, small enough that a horse was not needed to work it. Across the street from the church was posted a large information plaque giving information in Polish, German and English. In addition to a little synopsis on Grabow there was the familiar spiky cockle shell of the Camino de Santiago. 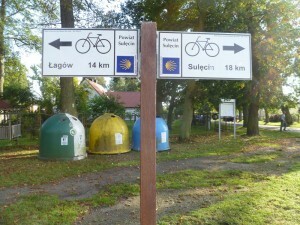 Near by directional arrows are marking the camino between Lagów and Sulecin!!! The plaque explained the camino and that one of the furthest starting points from the east started in Riga, and this is a feeder path heading up to it! We stopped by Wolfgang’s grandfather’s house where Wolfgang lived for the first couple of years of his life and Wolfgang left some clothes for the current inhabitants. We looked around the remains of the estate (the schloss was torn down and the bricks used to build a small development behind the “main” street.) Then we were off. We paused for a little refreshment in the crazy restaurant in Torzym/Sternberg and then were off to Berlin. I have left so much out and my thoughts are so jumbled. This has been so much to absorb. I will probably come back and revise and add more photos later. To say that I have been left with a lot to think about is an understatement. I remember the boundary changes for Poland after WWII. Wasn’t happy about all the Poles having to move.